You might even not like it. But it’s one of the most extraordinary places that you can see on the Island of Elba although it’s not a breathtaking seaview. 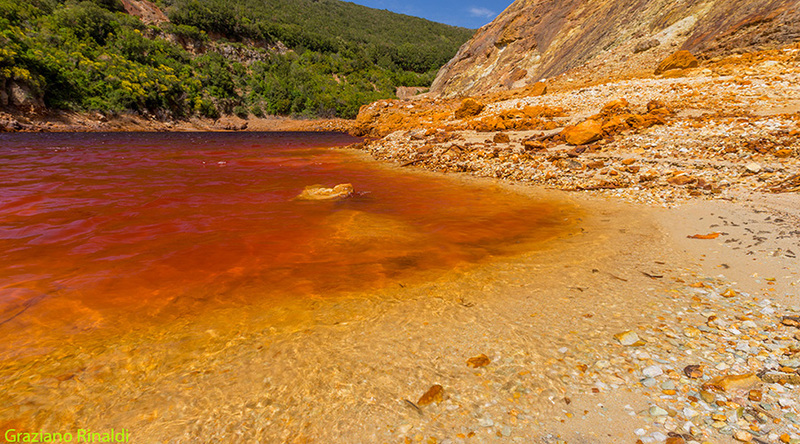 It is not even the brilliant blue sea that merges with the sky, or the stunning Mediterranean golden sunset, but instead it’s scenic red waters that look troubled. This is found in one of the less touristy areas of the island and even the islanders talk about it as a rather different place. 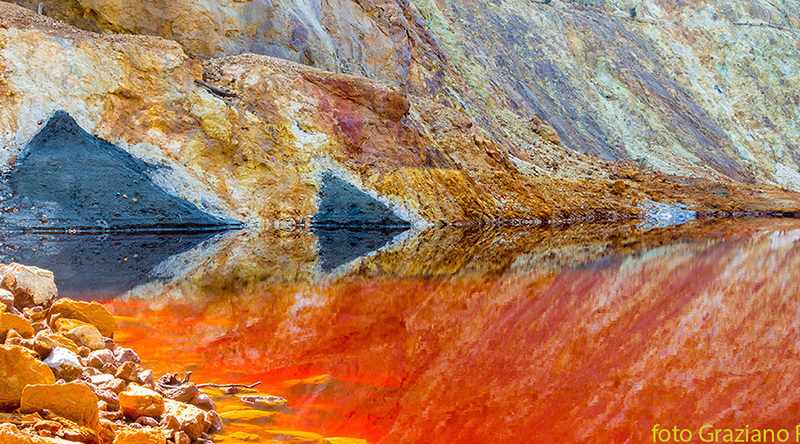 Like a ruby set in hard rock, this little lake with red water is sunk between high cliffs made of coloured earth. 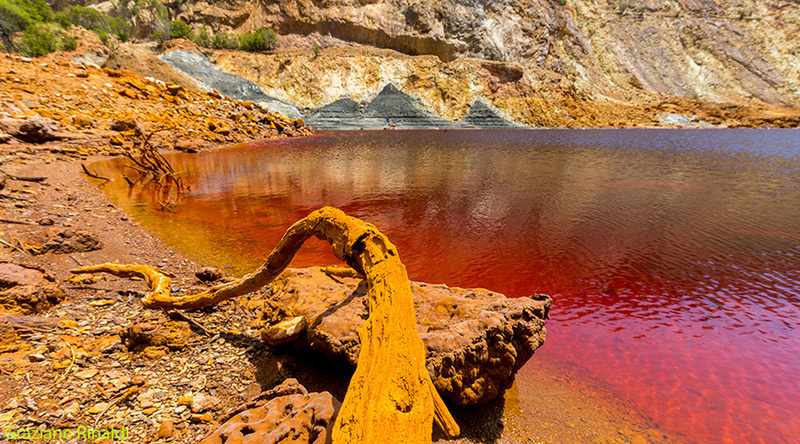 It is not a natural lake, it’s an old mining site in the open, in the municipality of Rio Marina, forced to close in 1968 due to a strong unstoppable ground water vein emerging from the deep layers of hematite enriched with oxidized iron. The rich lush vegetation around stops at the edge of the excavation, especially on the eastern side, which is high and prone to landslides. Half of this excavation is glimpsed near an old half collapsed pipe that was meant to pump water out of the gallery, the entrance of which can still be seen. I know for a fact that this year they carried out a caving expedition to probe the stability and the real dimensions of the mine..
It’s not a place to take for granted and you can’t visit without being accompanied by a guide of the Mineral Park: the walls are subject to landslides, and occasionally some pieces of rock fall. Along the perimeter of the lake are wet clay areas in which you can sink down quite deeply; the colour itself expresses a natural sense of danger that has nothing of “picturesque” about it. so much so that I have never seen any living organism moving in these waters, with the exception of some small unidentified white worms.. The lake isn’t more than a dozen meters deep, but its level depends a lot on the level of rainwater. During the dry season in some clay areas, cavities are formed in to tiny caves which are very dangerous to go near and sometimes you can see the extraordinary blue of melanterite stalactites. These clays, in addition to iron oxides also contain a certain amount of sulfur, the smell of which will be impregnated in your clothes if you go too close, but this is the matrix within which come out of the fine pyrite crystals. As you approach the lake, the surrounding silence becomes more intense. The feeling is like coming into direct contact with an immobilized world, petrified, made entirely of inorganic substance stubbornly reluctant to every evolution, enclosed by a hard layer of “rust” that even cap the stones. When the wind enters the crater, the lake waters reflect its gusts are reflected in a silver light and it seems like a jolt that can shake this otherwise immobile world..
You can visit the site “Le Conche”, as this lake is called by booking an excursion at the Mineral Park (tel. 962 088 0565 ask for Mark or John), it is not difficult and a walk lasts about two hours through some of the mining sites in the most beautiful open-air island and makes you think of Italy, if only for the colors and the amount of minerals that you encountered. What I can guarantee is that the visit to the “Conche” will shake something inside of you, certainly each person according to their sensitivity, but the arcane world, seemingly so far away from our everyday life, will be reflected in an inner normally silent dimension, but also extremely creative one.